The DOE announced the diversity plan. Mr. Lowe was quoted in the announcement and also was part of the Channel 2 discussion. Click here for more information. Mott Hall II on CNN! On Monday, November 7, 2016, the Mott Hall II newspaper was honored to host CNN reporter, Kelly Wallace and cameraman Jason Basso. Not only was our school newspaper, Inside the Halls highlighted, but several of our students were interviewed about the media's coverage of the election, including scholar's thoughts and opinions on what improvements could be made for the next presidential election. We are so proud of our scholars; they were poised, well-spoken, mature and expressed their opinions eloquently and enthusiastically. Additionally, please log onto insidethehalls.com to view our school's newspaper and read all the amazing articles our scholars work so hard to write each week. Click here to view the links to the video and article. Manhattan Borough President Gale Brewer presented our Principal with a Certificate of Appreciation at her reception honoring African American educators, in celebration of the African American Day Parade. Mr. Lowe accepted the honor with his family and members of his staff present at the Adam Clayton Powell, Jr. building on September 16, 2016. We are so proud of our Principal, Mr. Lowe, who was honored as a 2015-2016 Blackboard Award Honoree. Mr. Lowe accepted the honor on December 2nd, 2015, with his family and school community present to cheer him on! View his acceptance speech here. Mott Hall II was highlighted in this PIX11 news clip and article as a top middle school in New York City. Click here to see the news coverage. Mott Hall II, one of the most popular middle schools in NYC! Mott Hall II alum, Olivia DuFord and her mom, Robin Miles are featured in this DNAinfo article. Mott Hall II is listed as one of the most popular middle schools in NYC. Read more here. 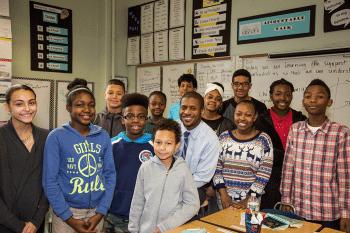 Our Principal, Mr. Lowe was named Principal of the Week in this feature DNAinfo article. Read all about our “energetic young principal."